Textile and Design Combine to Create the Art of the Wall - Look. The artistic effect wallcovering creates comes from two key components – the design, of course, but also the textile, which plays a vital role in the overall look of the wall. We’ve had so much fun discovering textiles to create a variety of looks for our clients. Each design and installation becomes a unique piece of art. The combinations are endless! Resilience may be considered a standard white background, but there’s really nothing “standard” about it. Designs stick to it and colors pop out from it like no other textile we offer. It has a slight texture and weight to it that is complementary to both bold designs like our “Marbled” in teal and subtle designs like “Bloom” in blue. This paper is all about the sheen. It’s subtle, but striking. It takes the design to another level. “Midnight” is one of my favorite designs – probably because it hones in on my passion for hospitality design. “Midnight” on Gold Iridescent is mesmerizing. The way light gently reflects off the gold sheen is just beautiful! The Industrial trend’s momentum seems endless. Industrial now combines with “farmhouse vintage” to create another design aesthetic. Look’s “Concrete” design on Steel paper is a design marriage made in heaven. The rich silver hue on this paper that seems to be made of metallic thread adds a luxurious element to an Industrial space. “Venomous” gives Steel a completely different look. It’s sleek and you almost expect it to feel soft when you touch it. Shine is our funky textile. Its texture stands out as does its sparkly silver base. It takes designs like “Whispy Feather” to a very grand and dimensional place. If you really want to make a statement with your wallcovering, Shine is your textile. We’ve chosen several Grasscloths to start with and are already in the works to offer others. Though Grasscloths give a more natural woven look, they are by far the most modern looking textile when printed on. The colors of “Bubble” in gold pop on Blanc Sisal, while the undertone of Gris Sisal adds another layer of dimension to “Whispy Feather” in blue. It just never ceases to amaze me how the subtlest differences of the textile can influence the feel of the design. We’re always on the lookout for the latest innovations when it comes to textiles, so offering environmentally-friendly options is important to us. Because of this, we’ve chosen many PVC-free papers, which means they are flame retardant, odor-free and easier to remove than standard vinyl papers. Currently, all of our Naturals and two of our Standards (Resilience and Gold Iridescent) are PVC-free. This quality gives clients the peace of mind that their wallcovering is not only beautiful, but also kind to our planet. Thanks for learning more about how Look Walls selects the textiles that turn your wall into a piece of art. 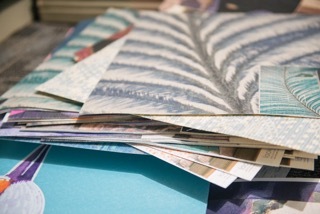 Check out the Look Book to see our current designs, and get playful mixing and matching textiles! Click here to view our different textiles.